I have a dual boot system with Windows 8 and Ubuntu 14.04LTS and I have a ASUS Xonar DGX. There's no sound in Ubuntu but it works correctly in Windows. I've looked at some of the other threads and used the terminal to check the card out. (That was a fun learning experience. :) ) The card appears to be recognized correctly. It shows as a CMI8788 [Oxygen HD Audio] in the sound settings as it should. But when I test the sound I get nothing. 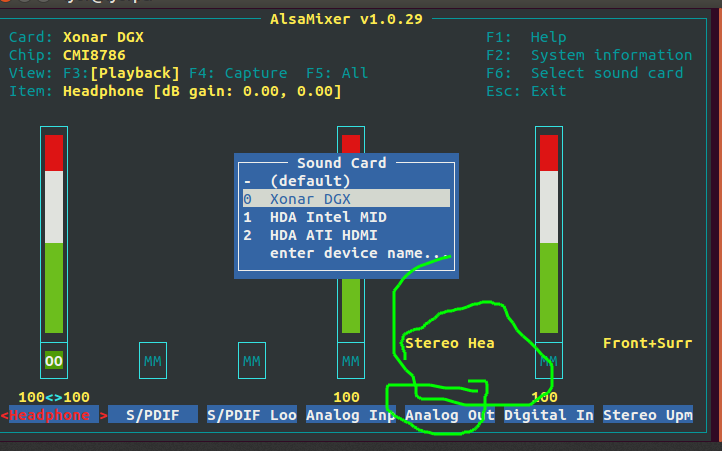 After fiddling around I started alsamixer, selected the sound card (F6), and changed Analog Output to Multichannel. Arrow over to "Analog Output" and arrow up/down to change to "Multichannel"
Hey all I just got a Xonar card working in my Ryzen 3 1300X Linux Mint 18.2 box. Mint is a fork of Ubuntu. This post/question is old but I thought I would mention that I used alsamixer as well. Multichannel works but I found that while the sound option in the control panel would show Headphones it was not specifying front panel audio or the port on the sound card. Alsamixer gave me "Stereo Headphones" and "Stereo Headphones FP". As soon as I selected "Stereo Headphones" it worked and sounds great! Hope this little update helps someone. Cheers. type in console alsamixer, choose your device by f6(if you can't see your card-device it not inserted) and go to 'Analog aut' by 'right-arrow', change the value by 'up arrow', press f10 to save. Maybe you should make appropriate analog output with sound settings on your ubuntu. I find my combination and it works. Now reboot your computer. It should solve your problem. Not the answer you're looking for? Browse other questions tagged 14.04 sound asus alsa or ask your own question.